De toegang tot deze begraafplaats. Op deze begraafplaats liggen onder enkele grafstenen meerdere soldaten begraven. 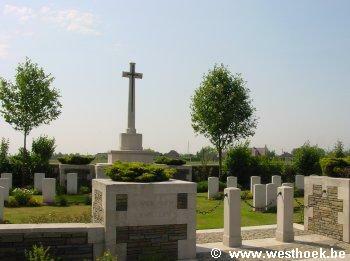 Somer Farm Cemetery is located 6.5 Km south of Ieper town centre on the Hollebekestraat, a road leading from the Rijselseweg (N365), connecting Ieper to Wijtschate and on to Armentieres. From Ieper town centre the Rijselsestraat runs from the market square, through the Lille Gate (Rijselpoort) and directly over the crossroads with the Ieper ring road. The road name then changes to the Rijselseweg. On reaching the village of Wijtschate, Hollebekestraat is reached by turning left from the N365. The cemetery itself is located 70 metres along the Hollebekestraat on the right hand side of the road. 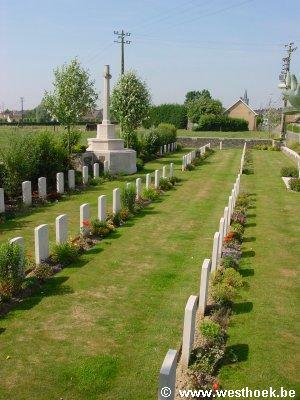 Somer Farm Cemetery No. 1 was begun in June, 1917 and used until March, 1918, and again in October, 1918. There are now nearly 100, 1914-18 war casualties commemorated in this site. 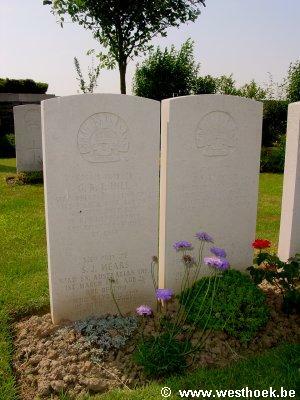 Of these, a small number whose graves in the cemetery cannot now be found, are recorded on special headstones. The cemetery covers an area of 633 square metres and it is enclosed by a low stone wall.